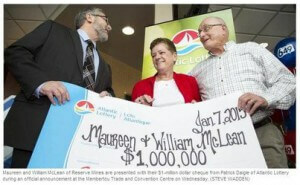 After winning a million dollars in the Lotto 6/49 lottery many people would consider Maureen and William McLean rich; but the happy couple is far richer than many realize. The McLeans have been a couple since their 8th grade and have been married for a whopping 52 years; not many people can claim to be half as rich in that aspect. Maureen who has been playing the lottery since the 1960’s used combination of her family members’ birthdays for the winning ticket she purchased from B.P.’s Main Stop in Reserve Mines on Christmas Eve. When she later checked her tickets, she discovered she was a major winner. A bus tour of Graceland and a cruise to Alaska are what the McLeans have in mind for their winnings. Their million dollar win sounds like a nice way to give this happy couple more fun in their sunset years.